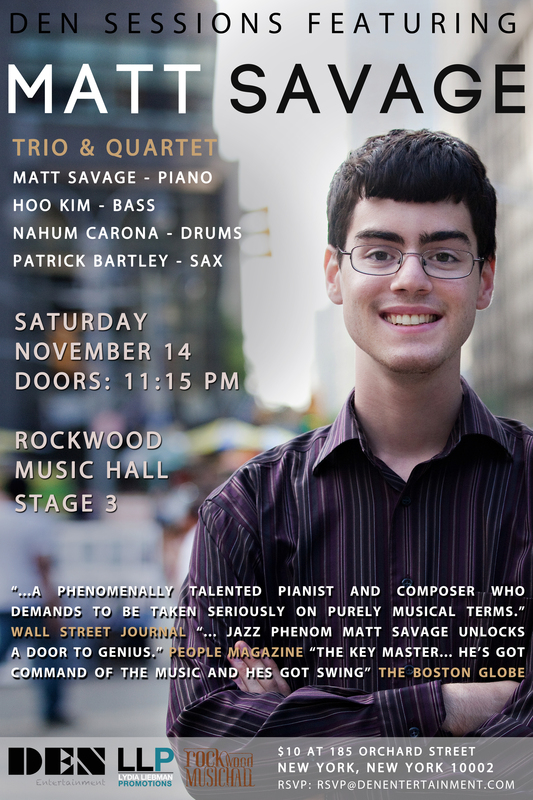 New York, NY- Den Entertainment Matt Savage Trio + Quartet on Saturday, November 14, at 11:15 PM at Rockwood Music Hall, Stage 3, located at 185 Orchard Street, New York NY 10002. Tickets are $10.00 and can be reserved by emailing rsvp@denentertainment.com. More information can be found online by visiting www.rockwoodmusichall.com. Matt Savage, age 23, has had a fourteen-year professional career as a jazz musician, bandleader and composer with ensembles of different size. He’s played with some of the biggest names in jazz since first labeled a “jazz prodigy” at age 8. Matt has performed with artists such as Chick Corea, the Ellington All Stars, Chaka Khan, Wynton Marsalis, Clark Terry, Jason Moran, Arturo O’Farrill, John Pizzarelli, and Joshua Redman, among others. Matt has recorded 11 albums as a leader, including 2013’s A Bigger Celebration, and 2014’s companion piece A Live Celebration: Kobe, Japan. According to Matt, A Bigger Celebration was a musical representation of becoming a young adult, with its release not long after Matt’s 21st birthday. Says Matt, “It’s the kind of jazz album you can play in the car on the way to a party, with the volume turned up and the windows down.” Matt is a graduate of Berklee College of Music and Manhattan School of Music and an artist for Bösendorfer pianos. While Matt is a seasoned player on the New York scene, this is his first appearance at Rockwood Music Hall. Longtime members of The Matt Savage Trio including bassist Hoo Kim and drummer Nahum Corona will accompany Matt for this special performance. Saxophonist Patrick Bartley will join the trio for some selections. Matt is excited to debut new material at Rockwood Music Hall, much of which has only been performed on his recent tour of Japan in September. Many of the songs performed will be a preview of what will appear on his upcoming album.